The offense itself is original, not borrowed or heavily influenced by any other coaches or systems. There are five key actions in the offense, two of which are completely new/original and another which I have seen used commonly overseas but not as much in the states. Another unique aspect for the offense is how we teach it. As you will see below, we don't just teach players the patterns within the offense, but we strongly emphasize that they understand how a zone operates... Much like a QB reads the safeties, calls out the Mike linebacker, sends a guy in motion, etc, to see what type of defense he is up against... we expect our players to understand fully what a zone is trying to do. Regardless of different fronts and unique rotations, all zones have to protect the same spots and guard the ball. We call this teaching the "box theory"... and how all we have to do is focus on the "ballside triangle" and attack 3 players. Once this is understood, it takes the mystery out of the zone for players and makes them much more relaxed and confident in their attack. Let's start first with the positions and formation of the offense. It is a four-out, one-in offense. The two wings are interchangeable but are mostly restricted to those areas (they also flash into the Lane). The post operates in the Lane, though he does set ball screens in the Point area at times. The two guards are also interchangeable in the Point area but can slide into an opening in the Wing to receive a pass for a shot (Diagram 1). The offense got its name from the fourth letter of the Greek Alphabet which is represented by a triangle. Through the positioning of our players and the ball, we have operating triangles all over the floor. The best position to operate from is when the ball is at the elbow as this provides two triangles from which to work from (Diagram 2). We often refer to the elbow as the "apex" for that very reason. 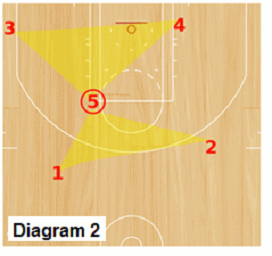 The next three diagrams (Diagrams 3 - 5) show other triangles on the floor that we like to operate from. Diagrams 6 - 8 show the basic positioning and slides of the players based on which side the ball is on in the Point area. 5 is always moving to the ballside elbow. 3 and 4 are to move to the perimeter when they are on ballside, and when they are on the weakside they move to the opposite block area. 1 and 2 remain on a string and must be sure to maintain good spacing of about 15-20 feet. 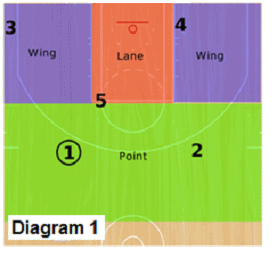 If the ball moves to the center (Diagram 8) then 3 and 4 must both be on the perimeter behind the 3-point line. 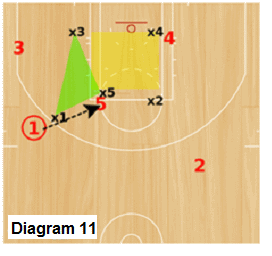 Teaching "Box Theory" and the "Ball-Side Triangle"
Let's begin with the offense against a standard 2-3 zone defense (Diagram 9). We tell our players that regardless of formation... 2-3, 3-2 or 1-3-1... all zones look the same when you move the ball to a side. As you can see in Diagram 10, when 1 dribbles to the left, a defender is assigned to the ball, another to the high post and another to the low post. Two other defenders are in help-side position. We call this "boxing" the zone. The box is highlighted in Diagram 11. No matter what the zone defense, the box will be there... Occasionally the backline may be distorted a bit by x2, for example, by extending him to deny a reversal pass but for the most part, this is what you will see... and we make sure our players understand that. Once the players understand that we are playing against a box, we then tell them we want to attack the three defenders at the front...which are the ball defender, high post defender and low post defender. We call this the "ballside triangle"... We basically ignore the other 2 defenders in help and tell our players that we are going to go after these 3 players. This is also highlighted in Diagram 11. 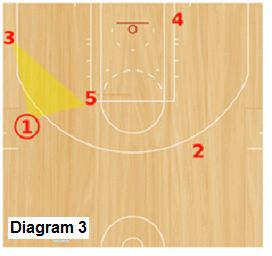 Our first option is to get the ball to 5, our high post (the apex). 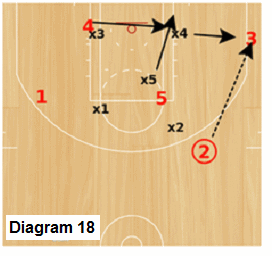 If that option is not available, one action we like to use is a simple ball screen set by 5 (Diagram 12). 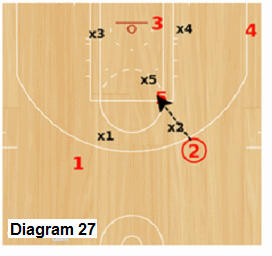 We love setting screens on a zone. Zone offenses that simply pass the ball around the perimeter drive me crazy because zone defenses are built to move ON the pass. 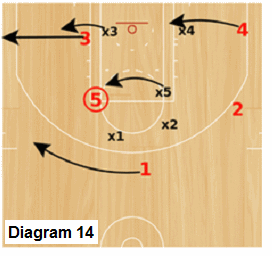 But zones are not built to defend screens as there are no additional defenders to help or hedge on the screen. 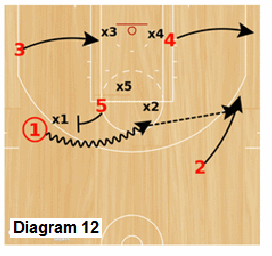 As 1 attacks the middle, the defense contracts leaving 2 wide open for a 3-point shot. 4 is also wide open on the wing. 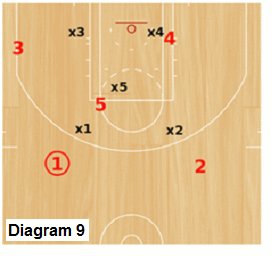 The ball screen is a common action against a zone but an effective one... we have no problem executing the ball screen with 5 two or three times consecutively, making the top of the defense scramble. Let's say 2 receives the ball and passes up the shot and elects not to pass to 4... and we decide to try to get the ball to the high post again. An easy way to do this is for 2 to pass to 1 in the middle and have 5 remain on the opposite elbow. 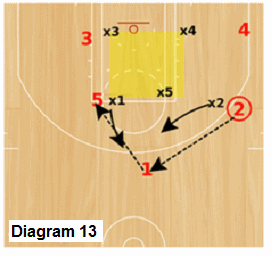 The closeout from the back of the zone on 1 leaves 5 wide open to receive the pass (Diagram 13). The ball has now switched sides again so notice the movement of the players in Diagram 14. Action #2 "The Euro High-Low"
There are subtle difference, though, in the way they run the high-low against a zone overseas (and in the Delta offense)... and these subtle differences can make a HUGE difference. Let's take a look at Diagram 15... .after 5 has received the ball. Once 5 receives the ball, he becomes the responsibility of x5. We then instruct 5 to front pivot to the outside (very IMPORTANT). Just this simple action will shift the zone slightly to the outside, leaving 2 WIDE open opposite if we want. Next, the post is to overhead pass fake to 3 in the corner (also very IMPORTANT). Pass fakes are incredibly effective against zone as they are taught to always move on the pass. The subtle actions of a front pivot outside and a pass fake in the same motion is usually enough to get x3 to bite... moving in the direction of the corner. It is even more effective when 3 is a good to great shooter. What we saw overseas was teams would simply put their best corner shooter in the spot, daring the zone to leave him open. 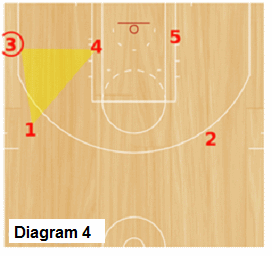 Every time 5 gets the ball in the high post, the wing on the opposite block (in this case 4) flashes to the opposite block. This is the Euro High-Low action. Now x3 has to make a decision. Does he cover the shooter in the corner or stay low to stop the flash? Most often, the front pivot outside and pass fake helped make the decision for him as he starts to cheat to the outside, leaving 4 WIDE OPEN. 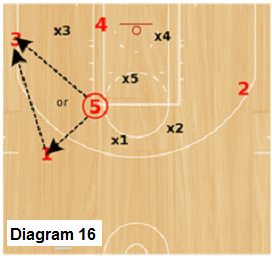 I can't tell you how many times I have seen this work... On this play, 5 is in the apex position as he can pass to 3 or 4... and also a wide open 2 or 1 for a three-pointer (Diagram 15 again). If 5 is a solid shooter or finisher, he can choose to score himself as well. Let's say 5 chooses to pass directly to 3 or passes to 1 who then passes to 3 (Diagram 16). 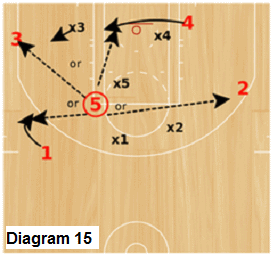 On the pass, the defense will have a player rotate to cover the low block (in this case it is x5) and x3 will extend out to the ball (Diagram 17). 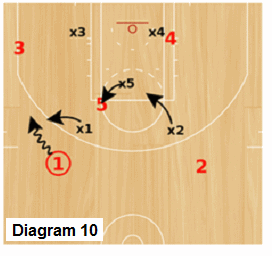 As x5 comes in to front or 3-quarter defend the block, 4 spins and seals... keeping 5 on his back. 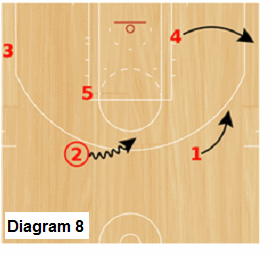 5 then cuts to the basket looking for the lob pass from 3. 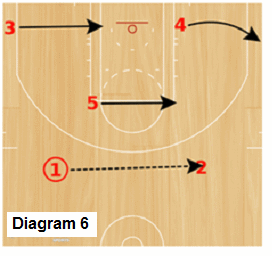 If 5 does not receive the pass, he goes to the opposite block. This is by far the most unique action of the offense and also my favorite. We have had a great deal of success off of this. Let's start with the ball in corner with 3. 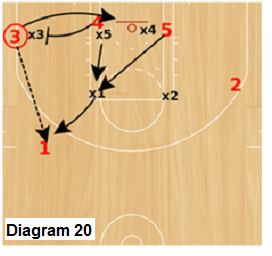 3 decides not to shoot it or lob it to 5 and so he passes the ball back to 1 (Diagram 20). Immediately two actions take place at the same time. 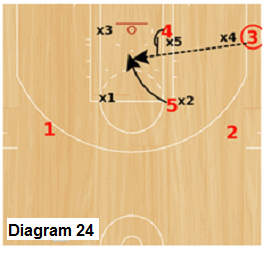 4 steps out to back screen x3 on the wing... and 5 flashes to the middle/elbow. 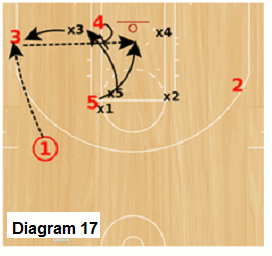 The natural rotation for x5 is cover the middle/elbow and so he typically moves in to defend 5... .at the same time, 3 is cutting off of the "flex" screen set up 4 and is WIDE open on the block (Diagram 21). After 4 sets the screen, he steps back out to the 3 point line and is open for the shot as well . Let's take a look at the play from the other side by reversing the ball. 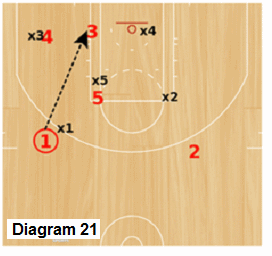 Notice, that this flex action causes the 3 and 4 to now switch sides of the floor (Diagram 22). 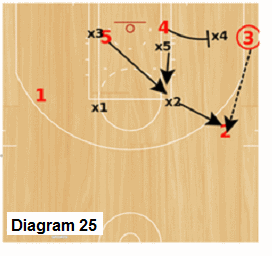 2 passes to 3 in the corner initiating the Post Dive action (Diagrams 23 & 24). 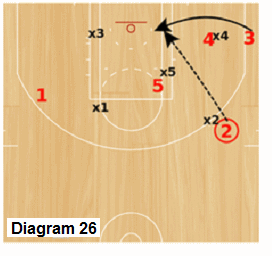 In Diagrams 25 & 26, 3 chooses not to pass to 5 on the dive... and instead passes to 2 to initiate the Zone Flex action. Let's say 2 does not pass to 3, but passes to 5 flashing to the elbow instead. Then we execute the Euro High-Low (Diagram 27 & 28). 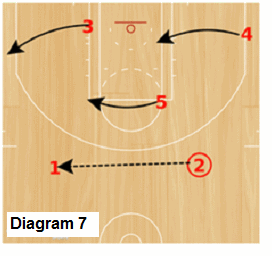 We call this the squeeze play because the spacing is a bit tighter as we execute a short shuffle pass and a hand-off. It is best used when you have players who can execute in traffic... It is a great play, however, and it just adds another option to the Euro High-Low action. 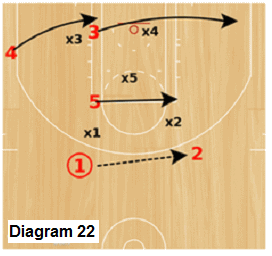 In Diagram 29, you see 2 coming over to set a ball-screen for 1. 1 then attacks the middle which draws x2 and even x5 to the area. 1 then shuffles the ball to 5 at the elbow. 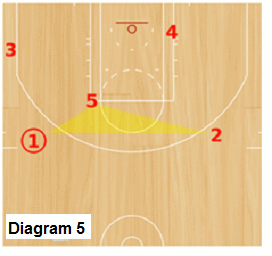 5 makes a front pivot but only goes half-way, holding the ball high as if he is to pass to the corner... pulling x3 out. 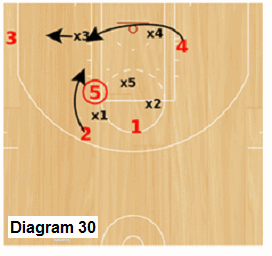 Turning half-way also helps shield x5 from the hand-off he is executing with 2. 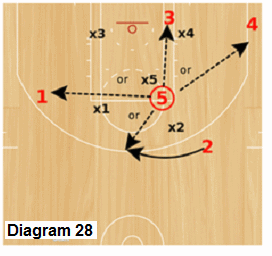 After screening for 1, 2 cuts right off 5 for the hand-off (Diagram 30). 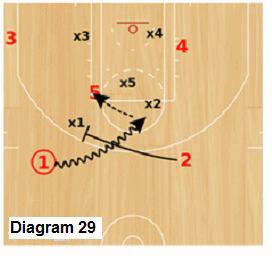 4 makes the same flash across the Lane, just like he would on a Euro High-Low Diagram 29. Not only is he a target but he can effectively seal off x3 to allow 2 to drive in for the lay-up.